Note 1. This site was set up in 2011 in order to post the information found when examining standing stones in Argyll, Scotland for possible precise alignments. Strong evidence was found for lunar alignments, hence the website title. Since then there has been found good evidence for the existence of solar alignments ( together with additional lunar sites) on the nearby islands of Mull and Islay which has been added to the website. It has been thought best to leave the website URL unchanged. Note 2. There is a brief biography in the Introduction which gives the background experience relevant to this investigation. To understand how astronomy may be involved, the reader needs to appreciate the difference between an orientation and a precise alignment. Orientations are general directions with a precision of a few degrees. e.g. the entrance to a passage grave, or possible orientations on the rising midsummer sun at Stonehenge. These are dependent only on the structure itself and not on any horizon feature(s). Alignments on the other hand involve a backsight and a foresight with analogies to a rifle. The backsight would be the structure (e.g. flat faced stone slab), and the foresight an horizon feature at a sufficient distance that the two together could potentially indicate a direction to within 2' of arc or better. i.e to within 1/30th of a degree, or 100 times more precise than the orientation of a flat side standing stone on its own. The present investigation revisits the question of lunar alignments outlined above with the aim of resolving the controversy by using an approach which is guided by the criticisms of Thom's work. This investigation considered only whether the stones were positioned for alignments to the sun and moon. Other issues such as religion and ritual are outside the scope of this study. 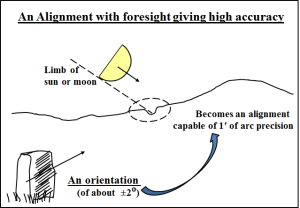 As described in the Introduction and Working Methods pages, because the Earths' axial tilt changes slowly with time, any original alignments will have lost their required precision after 2-300 years. Although any original alignments would have been set up by direct observation, we have to reconstruct the past by surveying each site with a theodolite and then superimposing the path the moon would have taken at the time of interest. Because of this the topic is sometimes claimed to be 'difficult', requiring considerable calculation. This is to some extent true for the investigator undertaking the calculations , but no-one reading this blog is required to do this. The work has already been done, and the results to date are presented. What is required is an understanding of the concepts involved. NOTE: A presentation on this work was given at the SEAC 2012 conference held in Slovenia in September. This presentation is available at the end of the Discussion section. It summarises the essential points in a concise manner and is suggested as a good starting point.